Most of the time end-of-the-year reflections are profound reviews of the past year. If that's what you're expecting from me you'll be sadly disappointed because all that's on my mind today is how bitterly cold it is outside; and just when I get engrossed in knitting the scarlet and gray mittens that I started on Christmas Eve the wind spews forth a huge gust of wind that rattles the west windows as a reminder of why I am so thankful for our cozy country cottage home and a husband who shovels snow! Feeling the need for a hot cup of tea, I went to the kitchen to set the kettle on the stove and while I was waiting for the whistle I gazed out of the window over the sink. Mini tornadoes of snow (snownados?) whirled across the stubble of the snow covered field to the west. The mail lady's car was disappearing down the road and I shivered at the thought of bringing in the mail. I peeked out the back door to see if the fleecy kids were outside enjoying the brief moments of sun as they often do; but they were nowhere to be seen having decided to stay inside their cozy barn. Even Nikko, who usually stays in the corner of his pasture nearest the barn, was inside his straw-lined condo. Nosy guy that he is, he came outside at the sound of the storm door opening to see if sweet feed was in his near future. When he realized that I was staying inside and only peeping out through a narrow opening, he promptly turned and went back inside. I lifted the whistling kettle off the burner, filled my mug and dropped in a tea bag of Rooibos. Sighing I decided to venture out and get the mail. Bundling up like Ralphie's little brother, Randy, in A Christmas Story, I stepped out with my trusty lab, Callie, at my side. She is always ready for a romp in the snow before returning to her nap in the warm house. Leaning into the wind I pulled my scarf over my nose and trudged out to the mailbox. The thought crossed my mind that if I, like Randy, should happen to slip and fall in the snow, I would have to lay there on my back like a overturned turtle until Rich came home hours later to help me up. By then I would be a frozen ball of mummified clothing! I made it safely back to the house, unbundled myself, and settled down to read the mail with my "cuppa." Although it's New Year's Eve, the traditional "party night," Rich and I will be going out together someplace nice for a lovely romantic dinner. There is a bottle of Prosecco chilling in the fridge that we will share at home after dinner with some gourmet hors d'oeuvres and imported cheeses to finish off the evening and ring in the new year. When we toast my wish for us and everyone else will be for a prosperous, healthy and peaceful new year. Happy New Year everyone! At last it's finals week; the end of the semester. My only class has their final on Thursday morning from 8-10 a.m. and after that I grade it and turn in the grades and I'm done. The freshman class population falls off sharply after the first semester and there are fewer sections of the class I taught so I won't be needed. I'm glad because I'm happy to have every day be a "snow day" in the winter time so that I can stay home in my pj's and wave goodbye to the school buses that pass my house on their way to school. I'll be thinking of my old colleagues as I sip my second cup of coffee and catch up on the news. Last week I baked a couple of batches of Christmas cookies: double-chocolate-mint brownie bites and mini-gingerbread men. I put them in the freezer straight away or else we would have devoured them long before the Christmas party this weekend. Rich has invited the people from where he works out for a beer tasting and I'm looking forward to it. We went "beer shopping" in Columbus over the weekend. That's the second weekend in a row that we've been there. The weekend before I shopped with daughter, Amy, and granddaughter, Olivia. The party menu is just tapas style and I have picked several munchies that I think might go with the seasonal and micro-brew style beers that Rich has chosen to taste. Of course everything is pretty savory and it seemed that I should serve at least one sweet thing. It's Christmas time. Cookies seemed the logical choice. I had a cookie cutter that I purchased at the Country Living Fair in Columbus a couple of years ago and haven't used it until now. Today I baked a herd of Christmas alpacas! They are the colors of the animals in our actual herd...white, brown and black. I am not sure how I am going to store them without crushing the bow around their necks. Maybe make a little alpaca barn out of sugar cookie dough? Nah! I used up my daily quota of ambition making the cookie herd so I'll just have to store them in my old le Cruset roaster. It's the only thing big enough. Queen Firenze is not impressed! After a whirlwind of a weekend, I finally have a moment to sit down and chronicle the events. On Friday Rich and I hosted 24 family members for our Thanksgiving dinner. All of the dishes were done at the same time and our contributions as well as the dishes brought by guests were delicious. The guests's ages ranged from a few months, the newest member of the family, Kelsey; to over eighty, Rich's dad, Ed. After the meal was over and everyone was relaxing and socializing, I slipped outside for a breath of fresh air and went around to the back of the barn where I found three of the kids playing King of the Hill in the gravel pile. Maddie, Mason and Shelby were taking turns climbing up the back of the gravel pile and sliding down the front...in their dress up clothing! A dust cloud seemed to follow Mason in particular, much like the Pigpen character in the Charlie Brown comic strip. He was really getting into the game. And I'm pretty sure that little Shelby totally ruined a new pair of glittery red dress shoes. As I stood watching the kids play, laughing and squealing all the while, I turned to check out the pasture and there I saw another group of "kids" looking on curiously. The alpaca kids were staring intently at the horseplay happening on the other side of the fence as if they would like to join in. On Saturday, Rich and I went down to Columbus where I went shopping with daughter, Amy, and granddaughter, Olivia. Steve, Max and Rich watched The Ohio State Buckeyes defeat arch rival Michigan in an exciting game. Then this morning while we were sipping our first cup of coffee, Rich surprised me when he suggested that we go out to breakfast (not the surprise, since we occasionally do that on Sunday mornings), and buy an artificial Christmas tree! 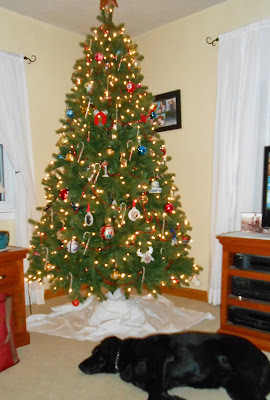 That one came out of left field since we have always had a real tree and had actually planned on cutting one today. Over the past two years we had talked about caving in and getting an artificial tree during the after Christmas sales, but just never got around to it. I never actually thought we would do it since we are both traditionalists when it comes to Christmas. Neither one of us would ever go for the all blue look or a designer type tree where everything matches. We kind of like our miscellaneous collection of ornaments and would never consider a tree that was any color other than green. But this year, folks, we went artificial. We got a 7-1/2 foot spruce type tree. It may not be real but I was not willing to compromise on the height. I am my father's daughter, after all. He always picked out a tree that had to touch the ceiling and so do I. We brought it home and immediately into the living room where we assembled it. (It takes way more than the 60 seconds to assemble than as advertised on the box!) Then we spent the next hour and a half decorating it and all the while I was having buyer's remorse and Rich was reassuring me that it was a nice full tree. I've had all afternoon and evening to get used to it and now, sitting here alone in the dark while I write, I must admit that it does look almost authentic. It is lacking the distinctive pine forest scent of the real thing but I can live with that. I'll get a scented candle or some potpourri to make up for it. I supposed I'll have to admit to Rich in the morning that I really do think it's a pretty tree. As if I didn't have enough to be thankful for, John Lillo, the absolute best tech guy and long time good friend, got my blog up and running this morning after literally hours and hours of work. A personal note: I can't thank you enough, John. The next step is to get the website up and running in order to advertise animals for sale and then to set up an Etsy account to sell our yarns, rovings and fleeces. This morning, while I was prepping the turkey and making the dressing for tomorrow (our family celebration of thanks) Rich was outside putting up Christmas decorations. Usually he does this chore on the day after Thanksgiving but due to extenuating circumstances the family dinner had to be scheduled for the day after. As usual, it is always cold and windy or rainy when he does this chore and Rich always says something like, "I'll just put up the lights on the fence," or something similar. Then once he gets started he finishes the entire task. We're working out in the little red shop after lunch today. We will be serving dinner to twenty or so relatives out there tomorrow and it needs to be rearranged a bit. Rich's grandma's old wood stove will be fired up and used to do part of the cooking for dinner and will also keep the building cozy and warm. Inside, the only decorating up so far is the Winter village over the kitchen cabinets. We put those up last weekend mainly because I was doing a tornado of cleaning before the holidays. It seemed an auspicious time to take advantage of Rich's height to take down the everyday decor and put up the village. Besides, I like to look at the lighted village in the evenings while I'm knitting from my perch on the sofa. It makes me smile. Out in the pasture the herd adjusted quickly to Leezza's return. She and Mango are buddies again. They usually pal around during the day as they are grazing and at night they sleep near each other. It has been so cold at night lately that we decided to put Firenze's coat on her. Her fleece is not as lush as it was when she was younger and we worry that she will be too cold. She looks so stylish in her red coat which contrasts nicely with her black fleece. Last year she tried to scratch it off against the fence but this year she seems to appreciate it. We also put Brutus's coat on and he seems to have no problem with it. I made Brutus's coat out of one of Rich's old jackets and it's already too small for him. He shouldn't need it much longer anyway since he's growing at a more rapid pace now. I often catch sight of him with his little head dodged underneath his mama, so he's nursing frequently. He is also one of the first to the trough when Rich distributes their food in the morning and can often be found nibbling hay from the feeder. I really do have so much to be thankful for. Wonderful husband, kids and grandkids; good friends and family; surrounded by contented alpacas and a dog, all super stress relievers; a cozy little farmhouse; a full stomach and a website that works! What more could a girl want? Our beautiful Leezza finally came home this morning after two months at Amy J's Homestead for breeding. After several attempts to breed her with Amy's handsome male, Salute, we are hoping that she is successfully bred. We will know for sure next October! When we released Leezza into the pasture the others rushed up to greet her and sniff around a bit. It had been so long but the two little boys seemed to recognize their summertime playmate at once and wanted to romp with her. Leezza, now a mature young lady, wanted none of it and gently back kicked little Brutus in warning. Asterius, however, was more persistent in his attempts to play so he received a hearty spit from Leezza. Both backed off. Nikko made several enthusiastic attempts to jump up on the top fence rail, seeking Leezza's attention and finally gave up when she indicated that she clearly preferred the company of her girlfriends. Took actually leaped up joyfully after sniffing her old friend and clung close to Leezza's side. Mango, on the other hand, seemed indifferent. Maybe she's still a little miffed at her old buddy for leaving her to cope with the two little males on her own. Mango doesn't really enjoy playing in the pasture with the kids like Leezza used to do. As we left the herd to get reacquainted a light snow began swirling around in the wind that lifted the flags on the porch. Today we are flying the Ohio State block "O" alongside the red, white, and blue, as is our custom on game days. Rich and I retired into the house to watch the game against the Indiana Hoosiers and to, frankly, pig out on chips and strong drinks as we cheer on our Buckeyes. With two minutes left in the first quarter, the Buckeyes are not disappointing us. They have already racked up 14 points (to Indiana's zero). OH---IO! After spending the weekend down in the big city with the kids and grand kids I have come to the conclusion that no one down there reads this blog. My own daughter didn't realize that I had been hurt by an alpaca determined to mate a few weeks ago and that I am still hobbling around on a bum knee. Occasionally Olivia sees one of my Facebook posts but that's about it. They have no idea how busy we country bumpkins can be. I think that's partly our fault since we halt normal operations when the kids come up here for a visit. Those visits are so few and far between that I don't like to be distracted with farm work or even travel for the purpose of entertainment, e.g. going out to dinner or shopping. I'd rather cook for them so that we can all sit around and just enjoy each other's company. Apparently they perceive this as idleness and boredom. Anyway, that led me to the conclusion that I could post all of my Christmas gifts for them on my blog. They would never know what I'm getting them because they never read it! So here is the knitted throw I am making for Olivia. She knows what I am making and even what color it is because she showed me a picture of a knitted alpaca throw in a catalog about a month ago. Said throw was almost $400 and she suggested that she would like it for her newly decorated room. I even found a washable, part alpaca yarn, Martha Stewart's Alpaca Blend on the Lion Brand website that would be suitable for a teenager's room and let her pick the color. The throw is about one-half way finished and is coming out beautifully. Next week is Thanksgiving and this year I volunteered to do the Kirgis family dinner. Of course, our kids are included and that's why we're having it on Friday instead of the actual holiday. That's when they could make it. I am not as stressed out as I usually get over this. Maybe it's because I'm not teaching full time and so in the back of my mind I know that I have plenty of day time hours to prepare for the meal. In the past, if I did any early preparation it had to be in the evening after school. I am an early morning person by nature and so I am not at my best in the evening after a long day at work. I'm liking this semi-retirement thing. I hope the holiday weekend is as beautiful and sunny as today. It's crisp outside but not windy like the past few days. Even the alpacas have spend the entire day out in the pasture grazing on the sparse grass that's left over after the freeze. I couldn't resist snapping some pictures. Even little Brutus seemed to be invigorated by the lovely autumn weather. He wandered away from his mama, Firenze, and made a couple attempts at playing with Asterius who is usually a little bit of a bully. They neck wrestled for a little while and when Asterius started getting a little too rambunctious, I was pleased to see little Brutus look over his shoulder and fire off a couple of warning spits in his buddy's face. I had some concerns lately when normally feisty Brutus seemed to be timidly retreating behind his mama whenever Asterius got too rough. I'm glad to see that he is fighting back. Asterius recoils from little Brutus warning spit. Taking the spit seriously, Asterius retreated and decided to check out Callie who was sitting near the fence enjoying a moment of contemplative solitude in the sunshine. I'm sure the dog was debating whether she could sneak out into the field to sniff out some wild critters. Callie, contemplating a break for the field. All the while, Sir Nikko was watching this horseplay from the other side of the fence. I'm sure he would have liked to join in the fun. Nikko, I'm sure, thinks that the grass is always greener in the other pasture. The grass is greener in the next pasture. Overnight the temperature dropped into the high twenties and the light rain that started at about 8 p.m. turned into snow. This morning we awoke to the first measurable snowfall of the season and two hour school delays because of the light coating of pebbly ice on the back roads. "The frost is on the punkin" to quote poet James Whitcomb Riley. I would guess we had about 1/2" more or less. I haven't heard the official stats yet. The icy stuff is gone from the road and somewhere around here someone is harvesting corn in the snow, because a tractor pulling a wagon load of corn has made a couple of passes by the house going at a pretty good clip. 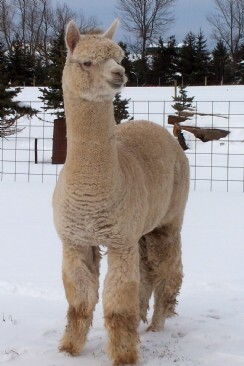 Earlier, I bundled up and ventured out to the barn to take a few cute pictures of alpacas in the snow. I spend almost half an hour out there and they apparently weren't in the mood to be cute. First, I had to literally chase them out of the barn where they stood looking hopefully at me, clearly wanting a sweet feed snack. Then, once I got them out there the whole lot of them refused to leave the barnyard area. They just stood there looking at me then at Callie, my crazy dog, who was running up and down along the fence line. Only three-month-old Asterius, who was feeling frisky, seemed to want to play. When he jumps on the back of his sister, Mango, or our queenie, Firenze, they both kick and spit in protest and he backs off. His mama, Took, patiently puts up with it but won't give in and play so then he attacks little Brutus who is thirty pounds lighter and a month younger. Brutus, also wants no part of Asterius's rough housing but is too small to fight back so he rushes to his mama's side and Firenze spits Asterius away from her baby. At this point, the little bully, Asterius, high tails it back to Took. He knows better than to tangle with Firenze when she's protecting Brutus! So that's it, folks. No cute pictures today. Except for Asterius, they just weren't in the mood for snow play.